Are you spending a lot of you time posting, commenting and sharing on your social media profiles? Are you having trouble following up on your sharing schedule? Would you like to spend that time focusing on more important thing, like your actual work? These days, social media sites have become essential to wast majority of big and small businesses. Although they give you an opportunity to reach more and more people with every new post or comment, all of these networks require your full attention in order to maximize your investment. If you run a company Facebook Page or a Blog, like me, you’re probably spending a lot of your time going through your stats. Analyzing your audience’s engagement in order to find that perfect time slot that gives your posts maximum exposure is no easy task. You need to really focus on your numbers and experiment with what you got. If you’re using social media for your business, it is of great importance for you to know what to share/post, when and where. You want to build up your brand awareness, and the only way you can do that is if you have some sort of insight on how your content is performing. It might seem like a small matter, but hitting your target at the right time and with right type of content, can give you an impressive growth in activity, and we all want that. We all want to see our content go viral, and new potential clients reading about our services and products. Sure, to those who are not dealing with their company’s social media management, this all may look like fun & games, but you and me both know that it’s actually really hard work. Following up on your social media strategy is as difficult as figuring out the perfect plan on how to run your profiles. Sharing, writing, commenting, reaching out at a specific time really makes you a slave to your digital presence. A lot of people really don’t have the time or energy to focus on these sort of details, nor do they have the funds to hire a social media manager. They need some help, and I think that Buffer could serve as a pretty solid solution for their online marketing problems. 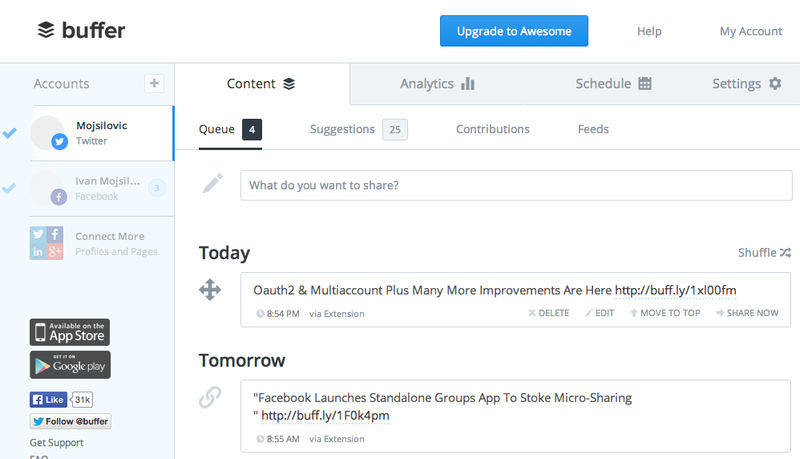 Buffer is a tool for scheduling your shares and posts on most popular social media sites. This simple and powerful app has an amazing analytical system that helps you measure the performances of your posts, so you can optimize your schedule and get the maximum out of your social media activity. To use Buffer, you just need to sign in with your Twitter, Facebook, or LinkedIn account, or you can create a new and original Buffer account. It’s good either way. Once you’re signed in, you can add more social network accounts and you can start posting and distributing your material anywhere you like to. If you don’t wish to send the status update to a particular site, you can click it in order to deselect. Once you do, it becomes grey and automatically lets you know that the information will not be shared with that profile. 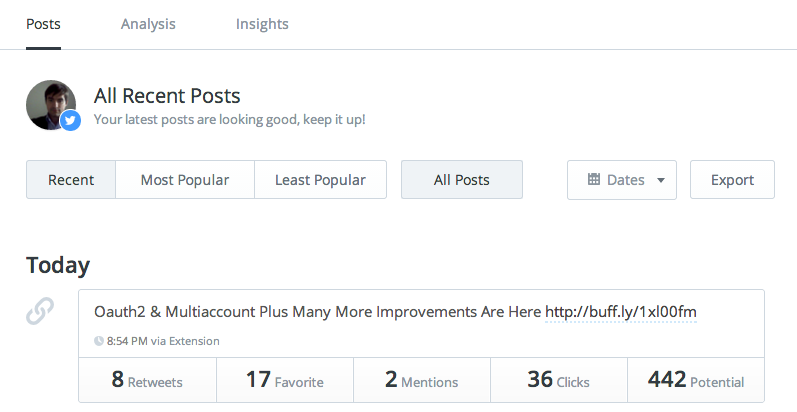 Buffer has a sophisticated and pretty easy-to-use interface. From the very first look at their layout, you can see that the guys behind this product are only interested in increasing productivity. There is no nonsense here, no useless options, only essential data. Buffer’s free service works well for personal usage, and its $10-per-month Awesome level service adds features every business who’s passionate about their online presence will be grateful to have. 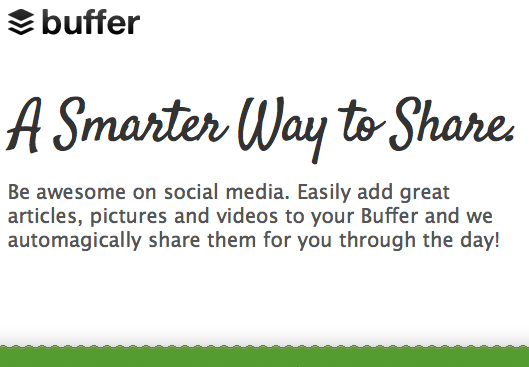 Buffer also offers a browser extension for Firefox, Chrome, and Safari that lets you share content from any Web page. It adds a small icon to your browser and lets you share directly from clients you like. This is where Buffer gets the advantage before all other similar apps. This tool offers a ultimate solution to sharing virtually any content you come across while browsing the web. As the primary feature of this app is the installation of the browser plugin, you don’t need to access the actual Buffer’s website in order to post material. This amazing tool gives you the unique ability to spread your content to all sorts of different social media website, with just one click. The Awesome level of service ($10 per month) includes unlimited posts, support for up to 12 social profiles, and the ability to have more than one person use the account. Buffer is a cool app that everyone loves, and I think you will too. Get this tool and you’ll never have to slave to your social media presence ever again.